Imam Musa al-Kadhim (a.s) is the seventh Shi‘a Imam. His father, Imam Ja‘far al-Sadiq (a.s) is the sixth Shi‘a Imam while his mother was a slave girl named Humayda. Imam Musa al-Kadhim (a.s) was born on the seventh of Safar (128AH/745AD) in al-Abwa’, while his parents were on their way back to Madinah from Hajj. 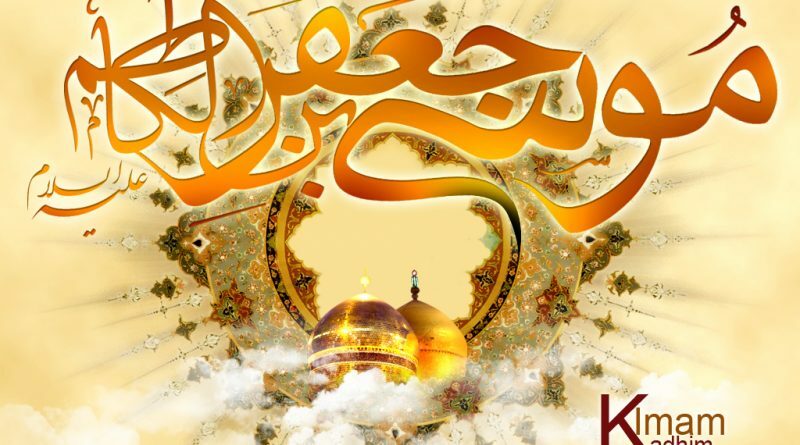 Imam Musa al-Kadhim (a.s) has been described as being a slim man of average height with dark skin and a thick beard. He was known for his resemblance to the Prophet Muhammad (s.a.w) in both his manners and actions. Imam Musa al-Kadhim (a.s) became Imam in 148AH/765AD after the death of his father Ja‘far al-Sadiq (a.s), who had insisted to his companions and followers that Musa be the next Imam. Imam Musa al-Kadhim (a.s) used to visit the houses of the poor in Madinah in the dark of night and give them gold and silver coins, palm dates and wheat flower, without the poor knowing who had brought them these gifts. During the time of the Imam, the government did everything in its power to limit Imam Musa al-Kadhim’s (a.s) activities because of his popularity amongst the people and a perception that he wanted to rebel against the government. In 183AH/799AD, Harun al-Rashid, who was the ruler at the time, placed Imam Musa al-Kadhim (a.s) in prison and ordered his men to kill the Imam by poisoning his food. Imam Musa al-Kadhim (a.s) died on 25th Rajab 183AH/799AD.